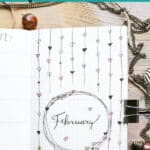 Looking for a fun bullet journal theme idea that is great for any time of year? 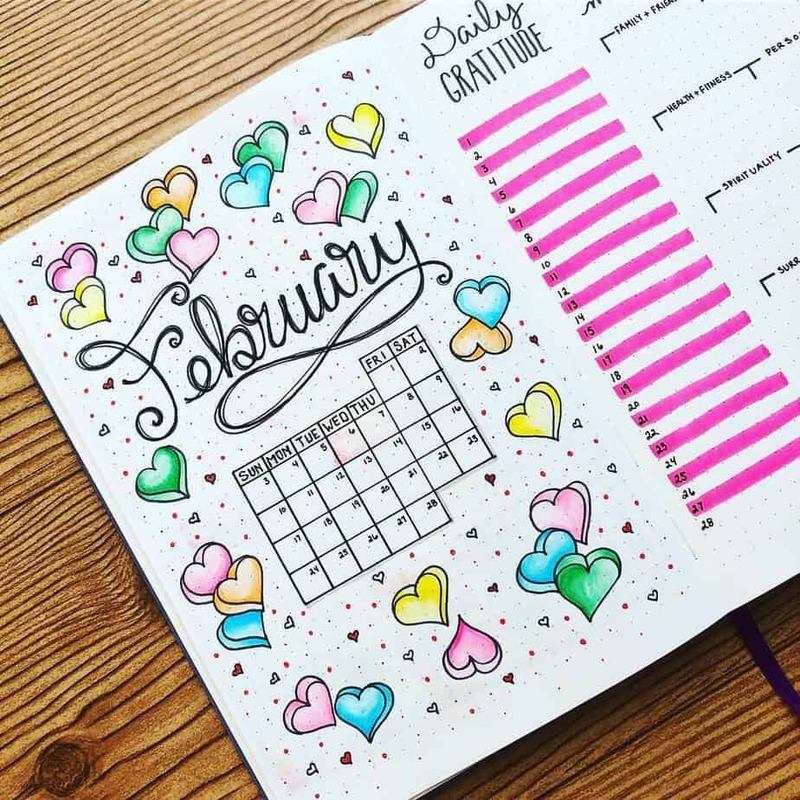 Then you will absolutely adore a heart theme for your next bullet journal monthly spread! 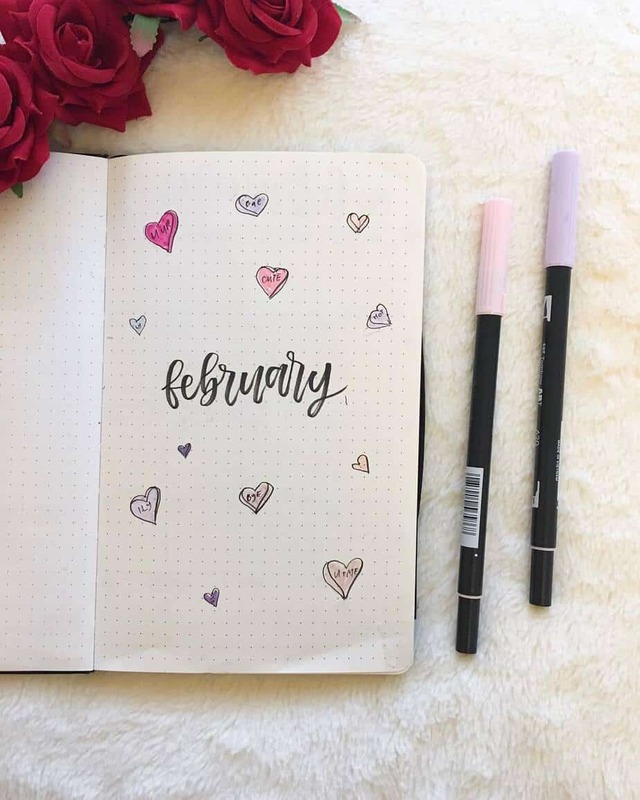 I chose a heart theme for my February 2019 bullet journal setup. 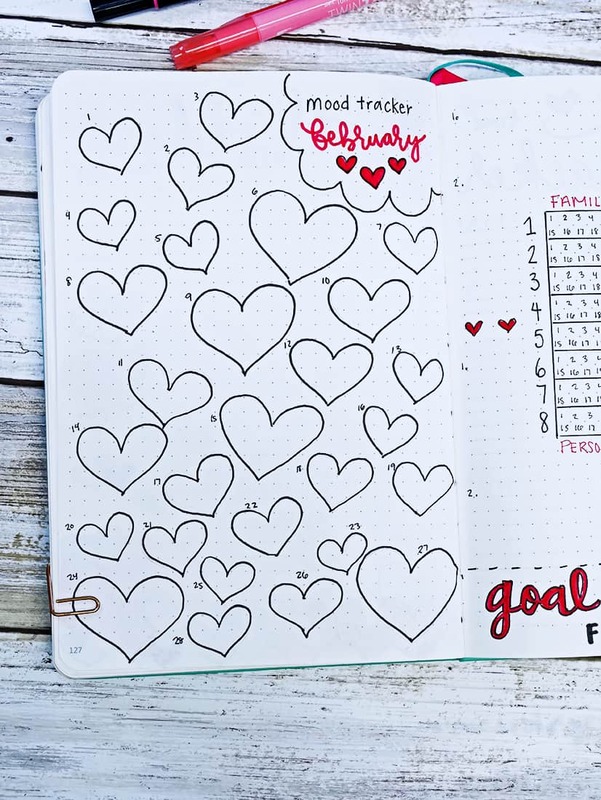 Since I’m trying to find theme options that are a little less complicated, but still super fun and customizable, I thought hearts would be a perfect fit to suit those needs! 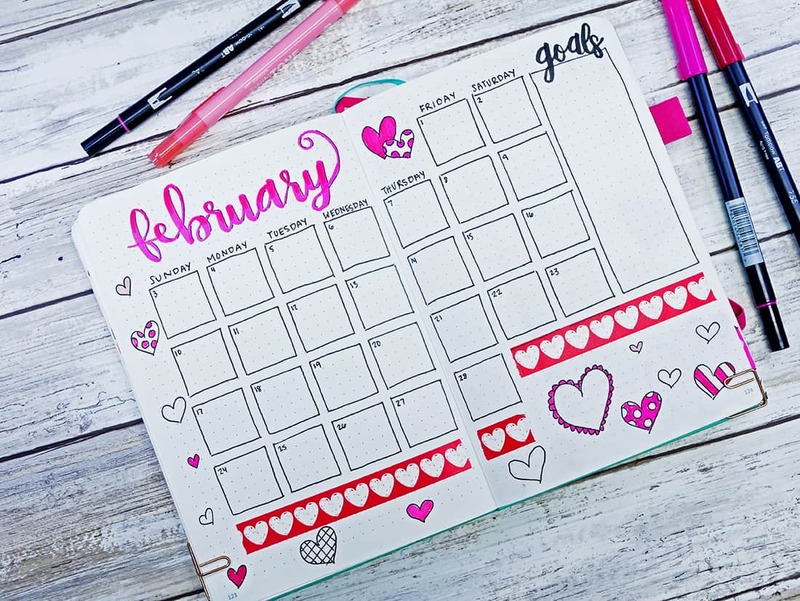 Check out my setup for the month of February using a heart theme! Toward the end of the blog post, I’ll include some amazing layouts from my followers on Instagram. I LOVED this cover page! I did a loose interpretation of a few spreads from AmandaRachLee and it was so much fun. The nice thing about doodle spreads is that they are generally very easy to create and don’t take a lot of time to set up. 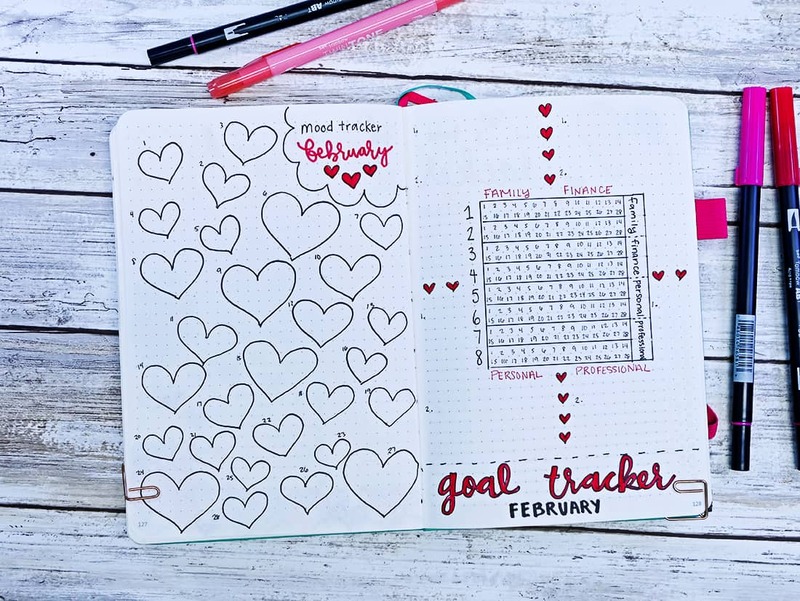 I found some great doodle options on Pinterest and used many simple heart and Valentine-themed doodles to complete the look. My monthly calendar layout turned out this time! Not sure if you saw last month’s unicorn theme setup but I royally messed up the calendar. This month, I replicated the box layout and used simple doodles and washi to decorate the setup. I even had enough space to add a goals section! I used my favorite Tombow Dual Brush pens for the calligraphy; they are so great for color-gradient handlettering. Here’s an exercise for you: can you spot the mistake I made in this layout, and how I fixed it? Tell me in the comments if you find it! Went with my typical structure for my habit tracker layout, though maybe a little less structured than usual. Sometimes drawing boxes all the time gets old. Personally, I loved how this turned out! 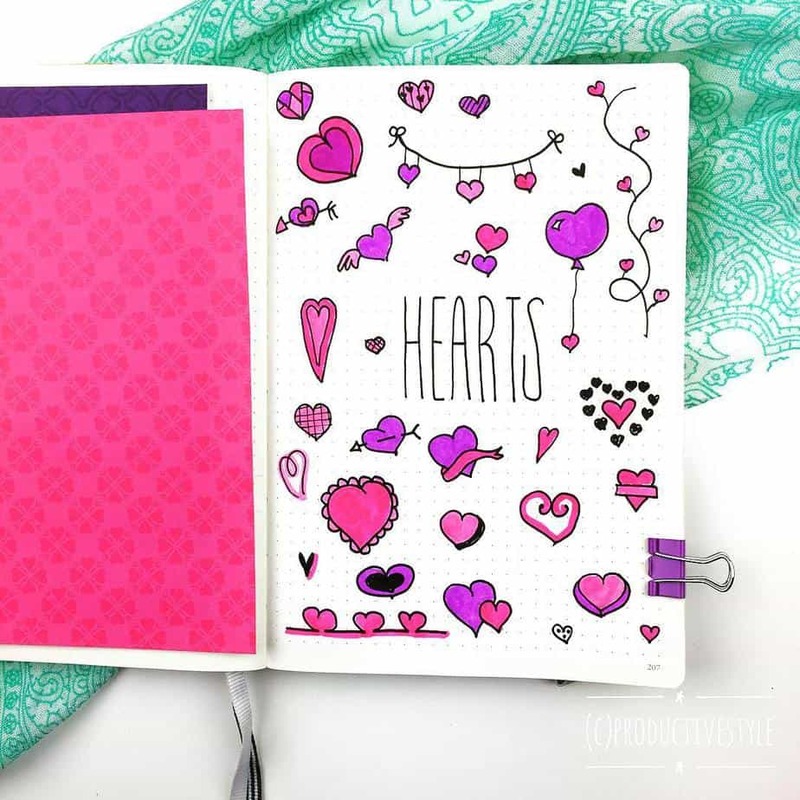 The heart doodles on the bottom are super pretty and again were easy to create. 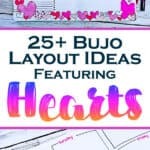 Make sure to watch my video at the end of this post for some tips to make a pretty heart border like this one! I loved themed mood trackers. 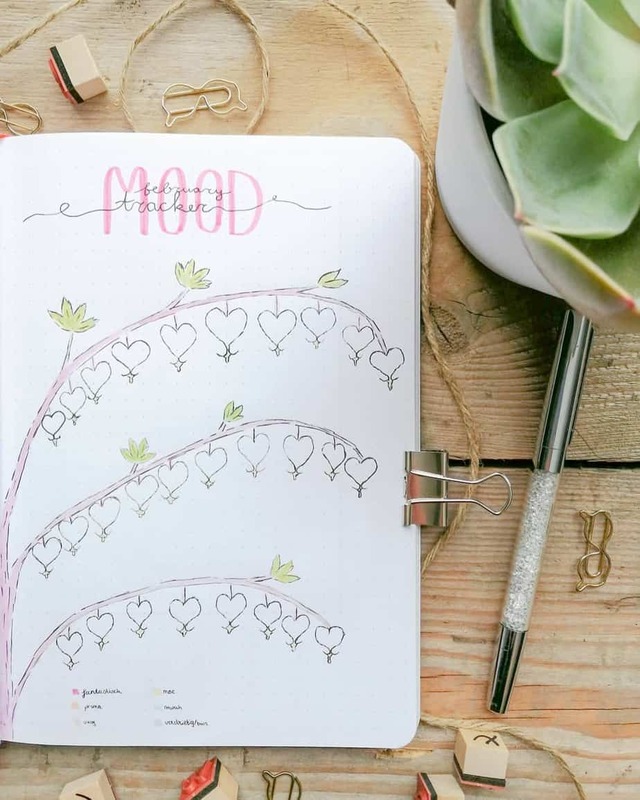 This mood tracker with hearts and super easy to create; I didn’t even use a stencil! 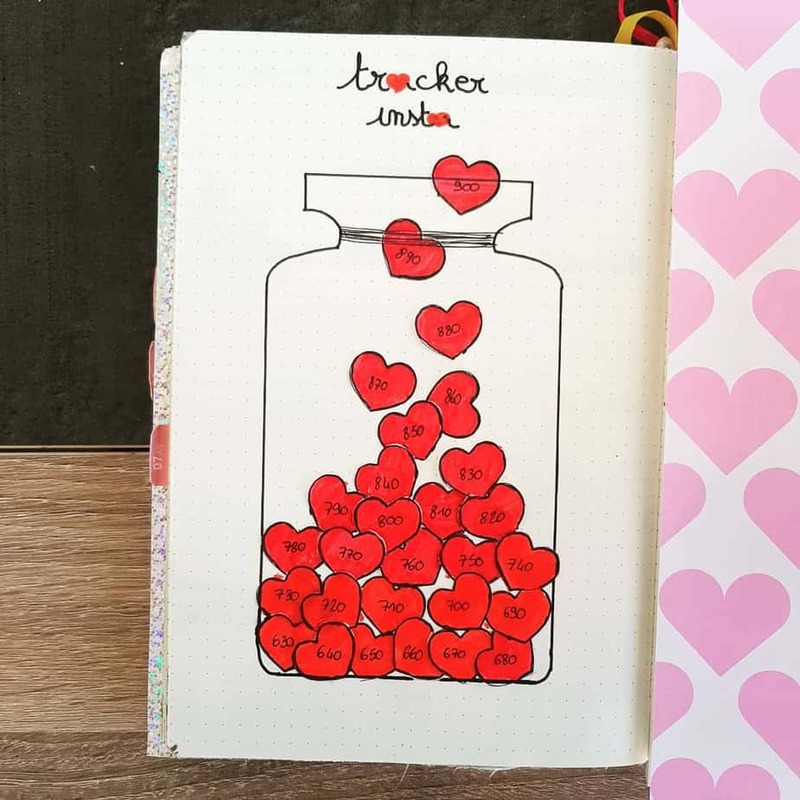 You could do a lot of other fun ideas for a mood tracker using hearts. 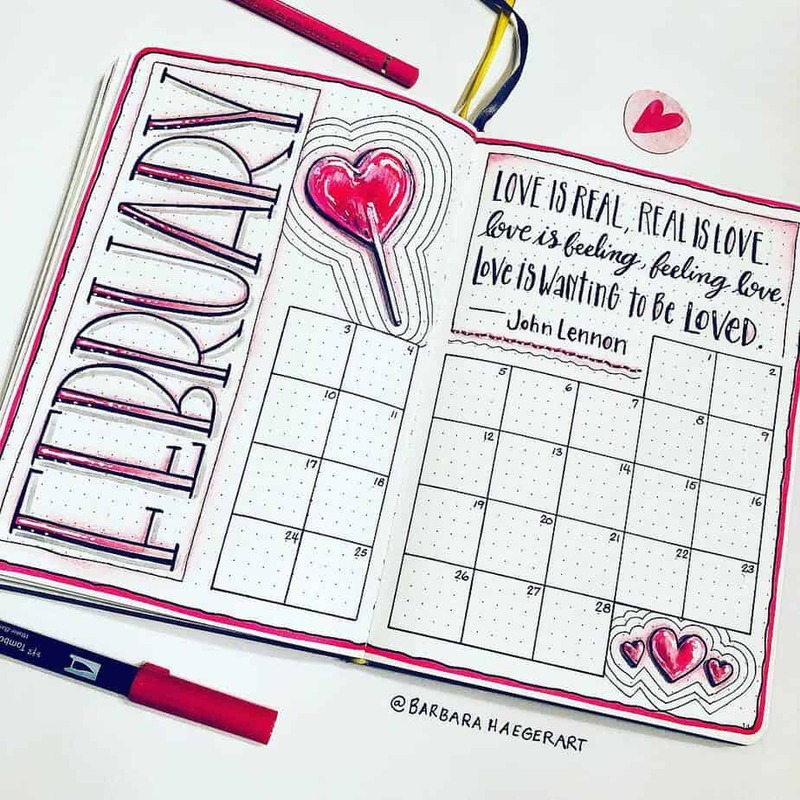 You could create one giant heart and split it up into different sections for every day of the month. On the other side of the mood tracker, I created my goal tracker. 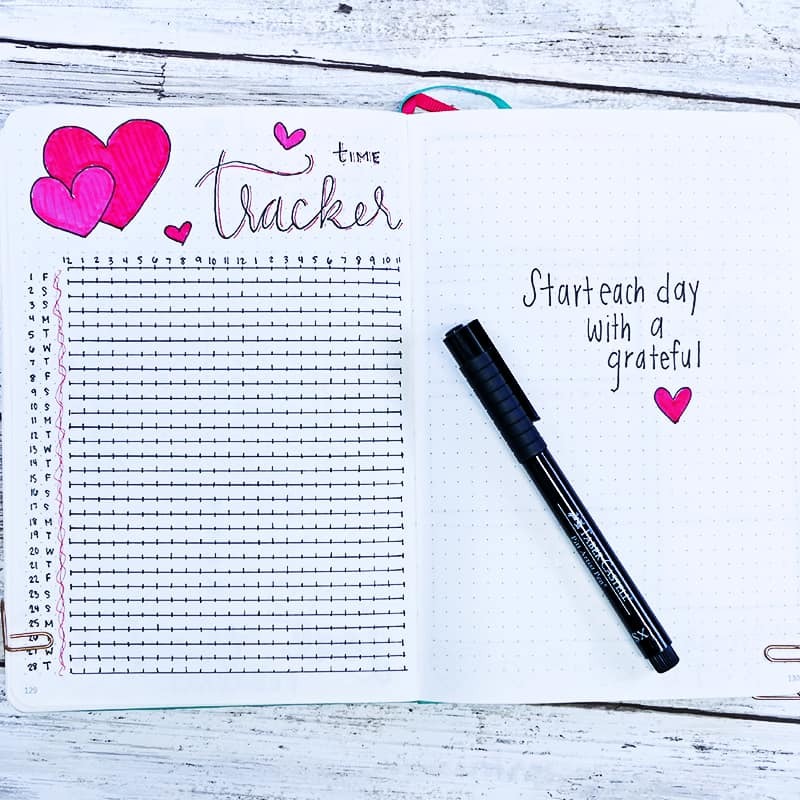 I tried a very unique layout for my goal tracker that allowed me to easily monitor my daily goals. I utilized the outside section of the page to label the goals that I want to track. Last, I used heart doodles to help separate the labels for each category. It turned out very cool! 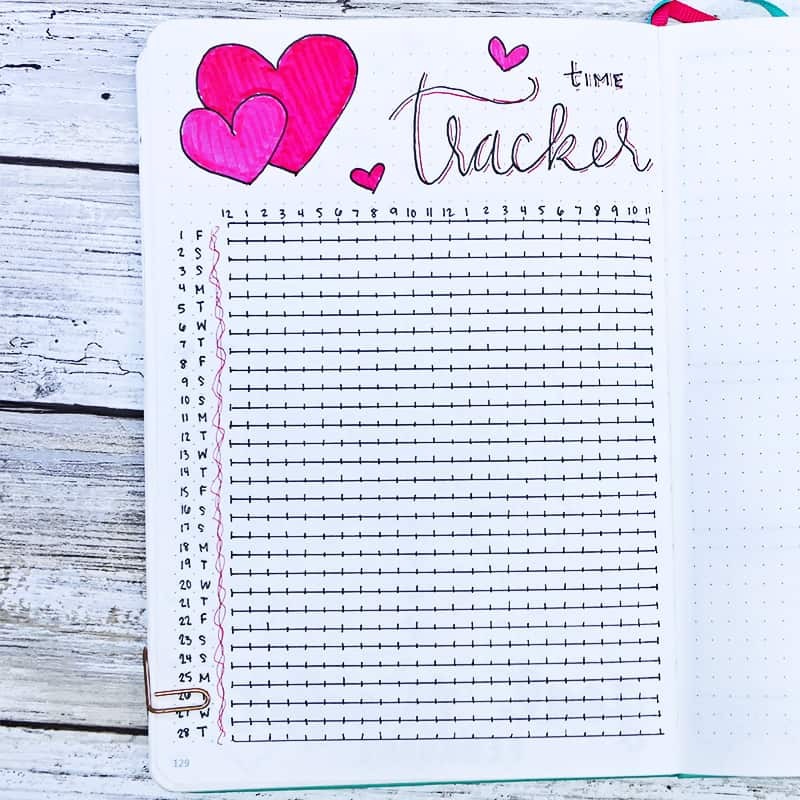 I set up a traditional time tracker layout with pretty heart doodles for my heart theme spreads. 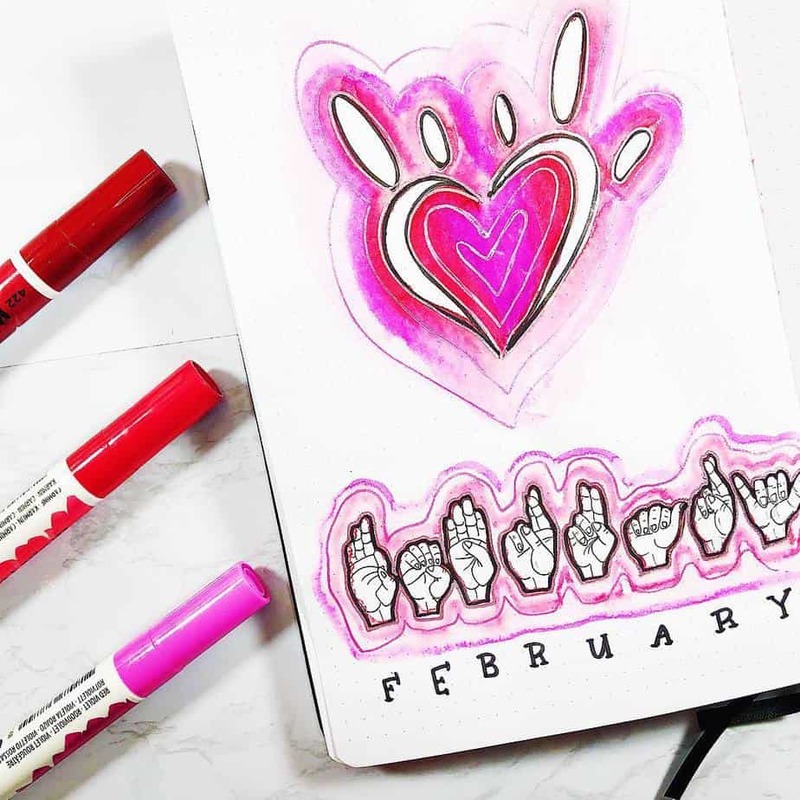 For my weekly layouts, I thought it would be fun to change up the heart doodle styles for each weekly. Most of my monthly layouts in the heart theme had a similar look. Oh, and in case you didn’t know, I do all of the same types of weekly setups for the month! This makes it much easier to optimize and complete my spreads. 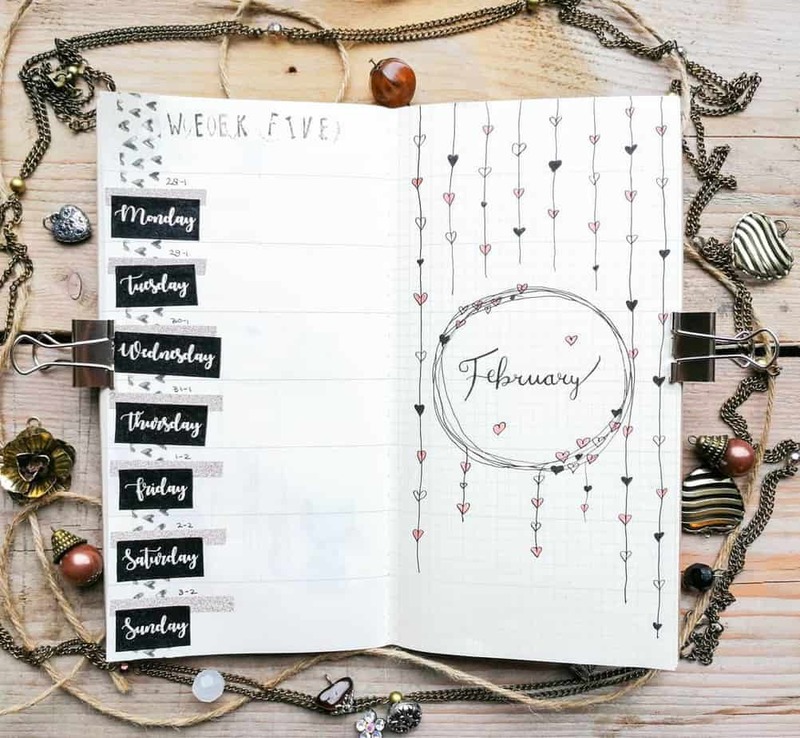 Absolutely adore this weekly layout. I love hearts, I love polka dots, and I love pink! Very cute and fun while staying minimalist! This was another fun layout! I actually used stickers all over this spread! The heart and envelope stickers came from my latest monthly Pipsticks Subscription Sticker Pack! I love getting new stickers in the mail every month! Make sure to use the code ‘MINDFULLY20’ to receive 20% off your first monthly subscription pack! You also probably can’t tell that most of my labels also come from stickers. My friend Rose makes incredible stickers, so make sure to check out her RoseKPaperCo shop on Etsy. She makes incredible things you need to get your hands on, like, yesterday! 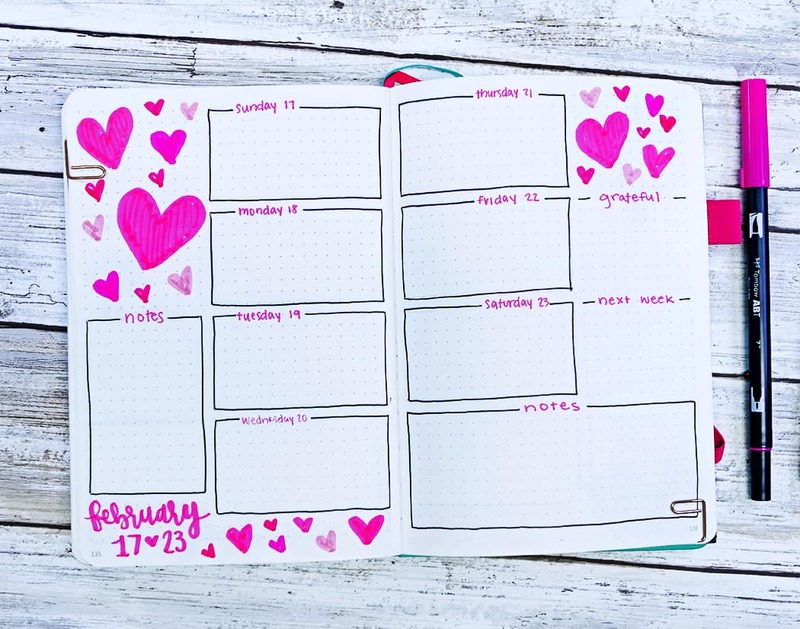 Simple and easy drawn hearts made for another great minimalist weekly layout! I couldn’t live without my Tombow Dual Brush pens! 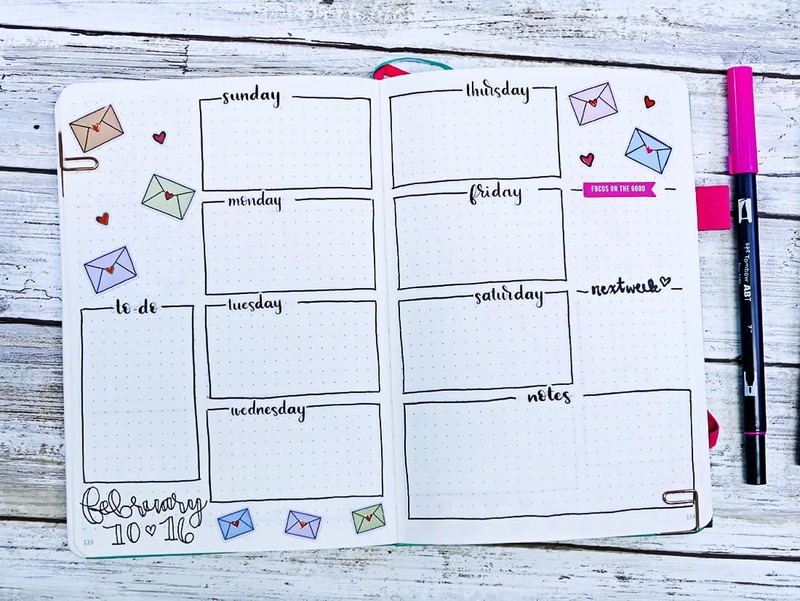 Since I had so much fun with washi for my monthly calendar, I decided to use more washi for my last weekly layout! I also went with some phrases that, personally, I thought would be great for the heart theme. This spread is still minimalist but so, SO beautiful! 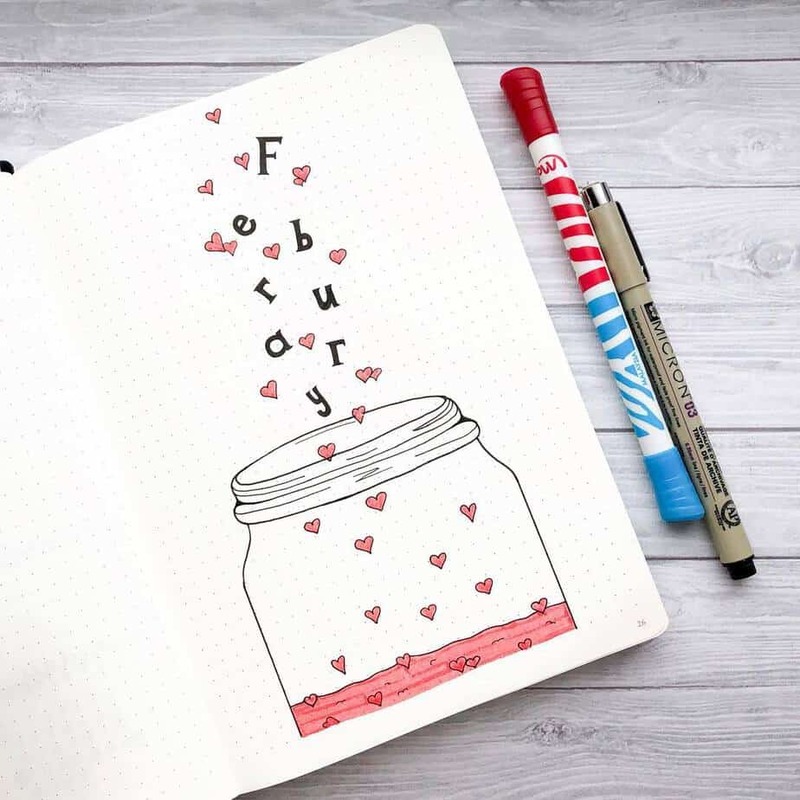 My monthly review helps me organize the content that I write down throughout the month. 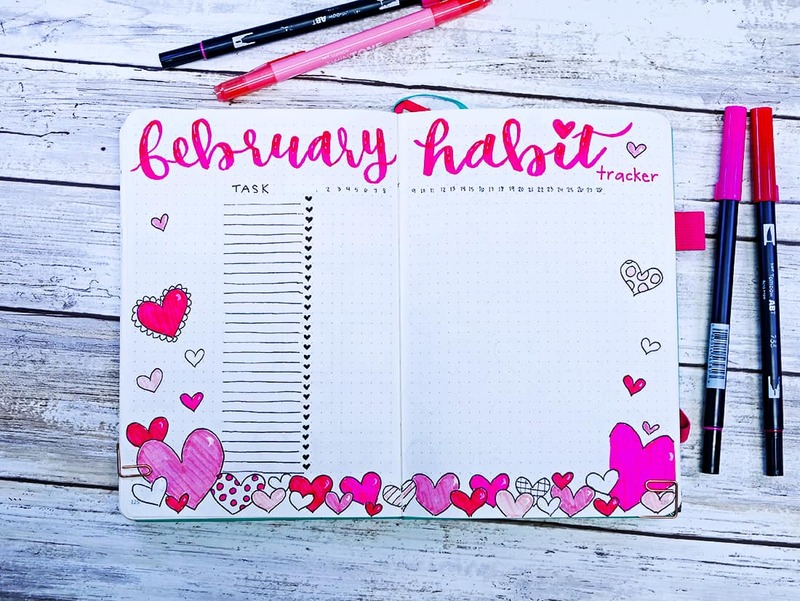 I go through my trackers, goals, and various spreads to see how I can improve my layouts for next month! Depending on the number of spreads I create for my monthly layouts, sometimes I end up with an awkward extra page. So one of my favorite things to do with ‘awkward’ blank pages is to find an amazing quote that is relevant to my theme! 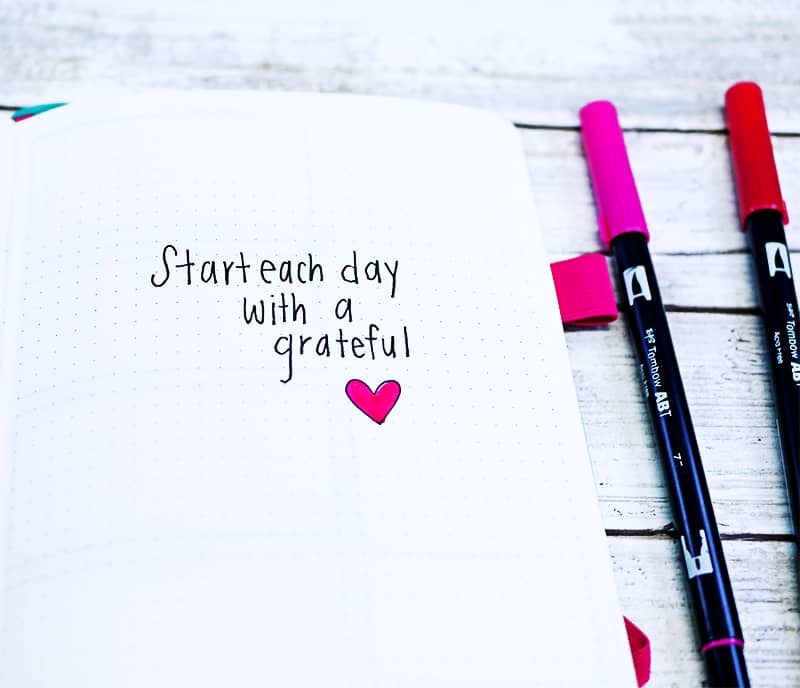 For the heart theme, I chose the quote ‘Start each day with a grateful heart.’ I kept decoration very minimal and added a pretty red heart underneath the quote. It’s one of my favorite spreads for the month! 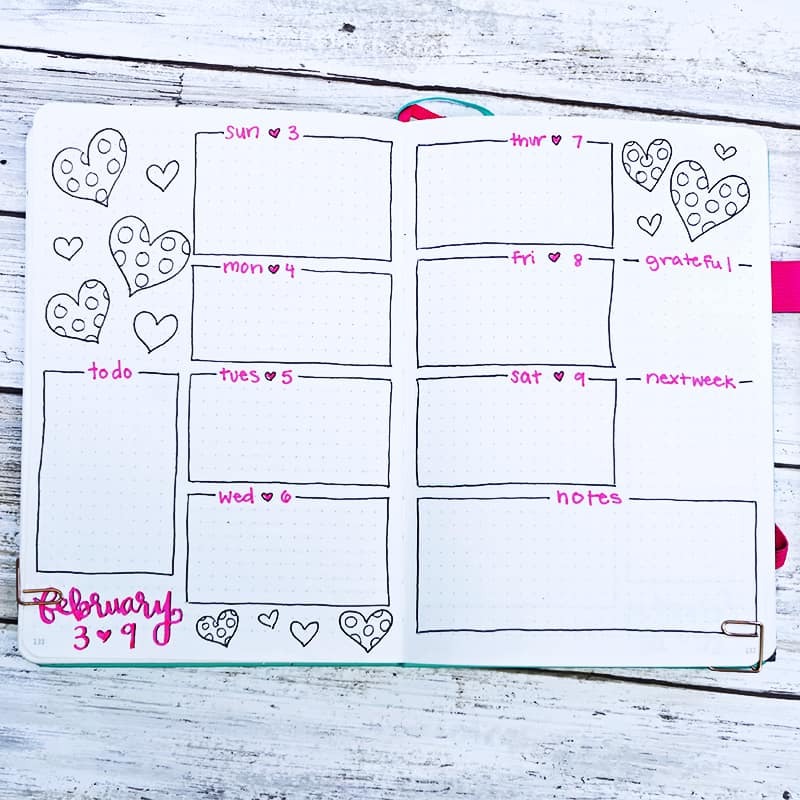 Here is the bullet journal plan with me video for this lovely heart theme setup! It’s a lot more interesting to watch it in real time, personally! 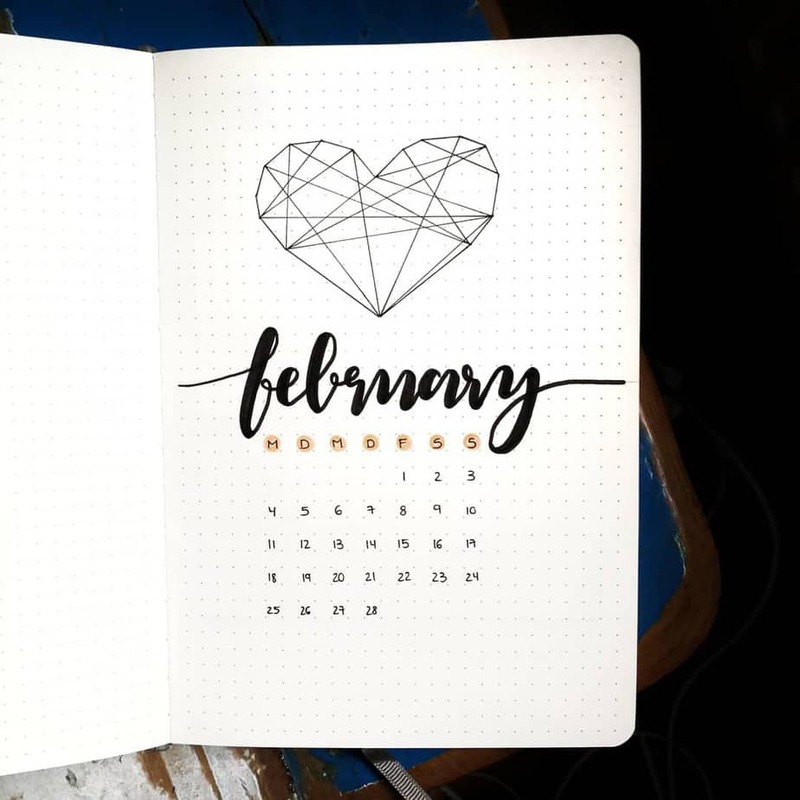 This video focuses on the monthly layouts, but make sure to subscribe to my channel because there will also be a weekly layout video posted very soon! 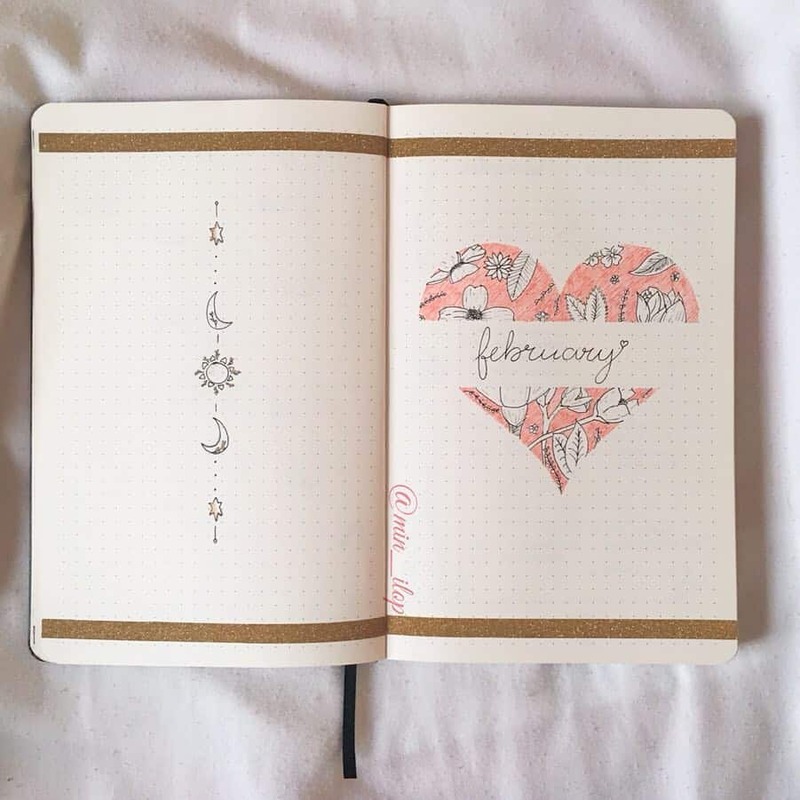 Otherwise, keep scrolling down to find more beautiful heart theme bullet journal layout ideas! 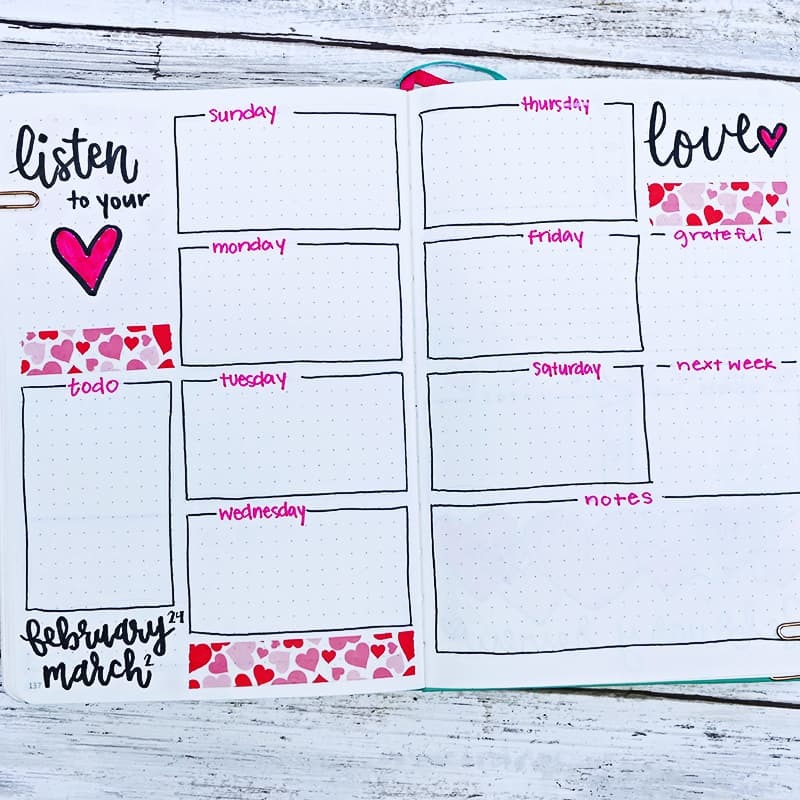 Looking for even more great ideas for great themes, like this heart-themed bujo set up? 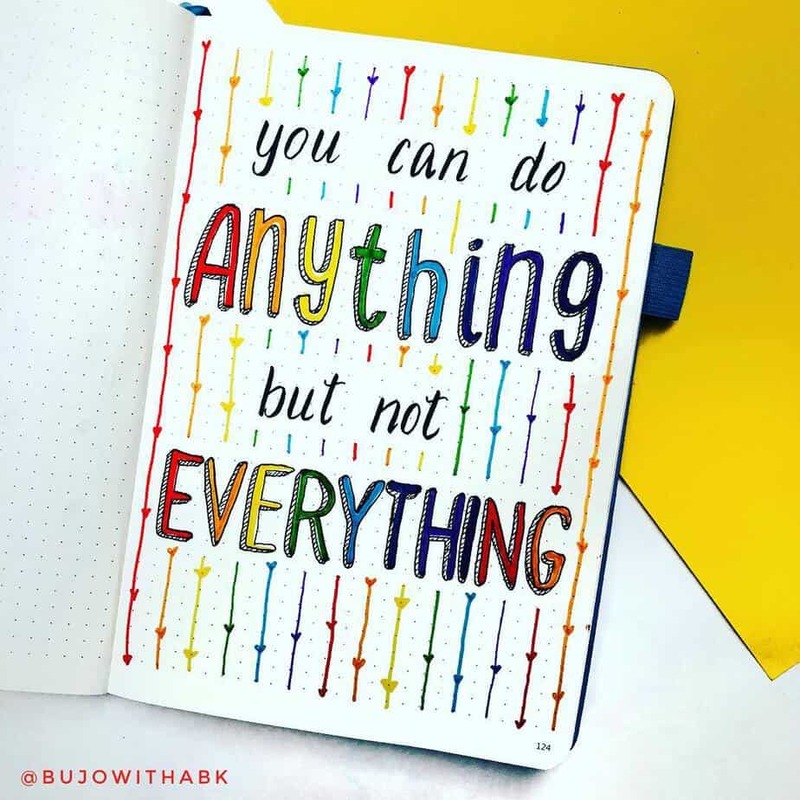 Get even more monthly theme for your bullet journal here! My last few themes I didn’t have as many amazing inspirational ideas from my followers, but this time I got proactive! 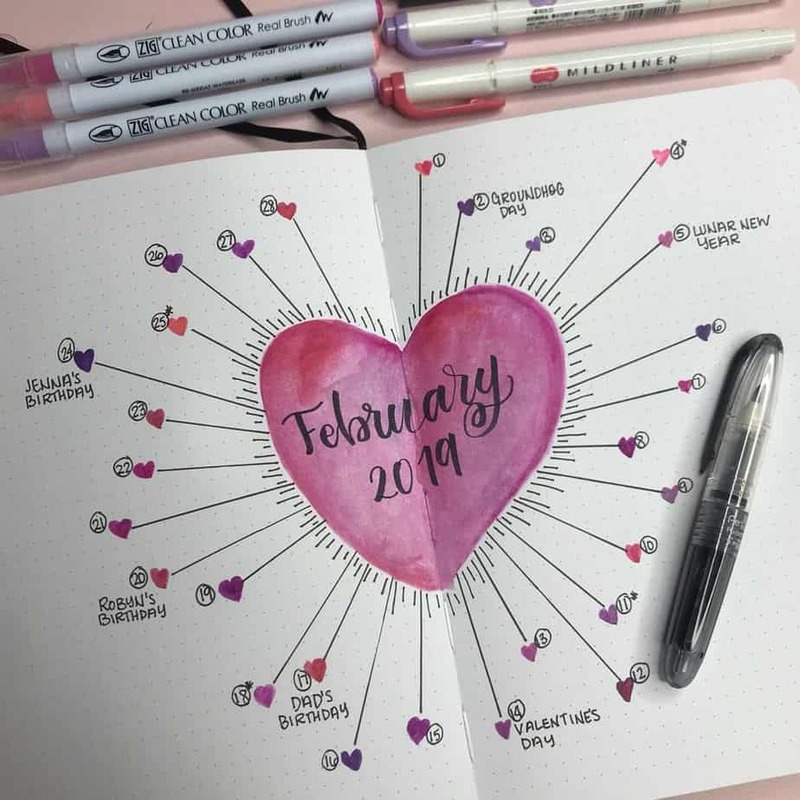 I asked on Instagram who had heart doodles, heart layouts, heart bullet journal ANYTHING… and the response blew me away. Overall, I really enjoyed this theme. Hearts are just so incredibly easy to create! 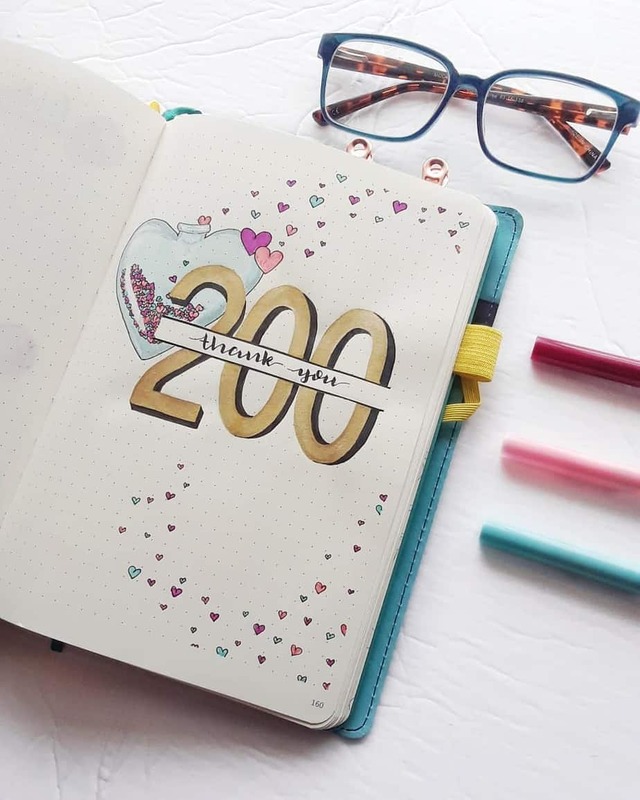 Considering how simple and straightforward the shape is, there are so many ways you can play with this adorable bullet journal theme to find a style that suits you. 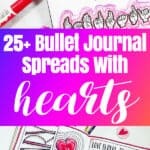 Not to mention, a quick hop online and you will find a plethora of amazing ideas on how to use hearts in your bullet journal. 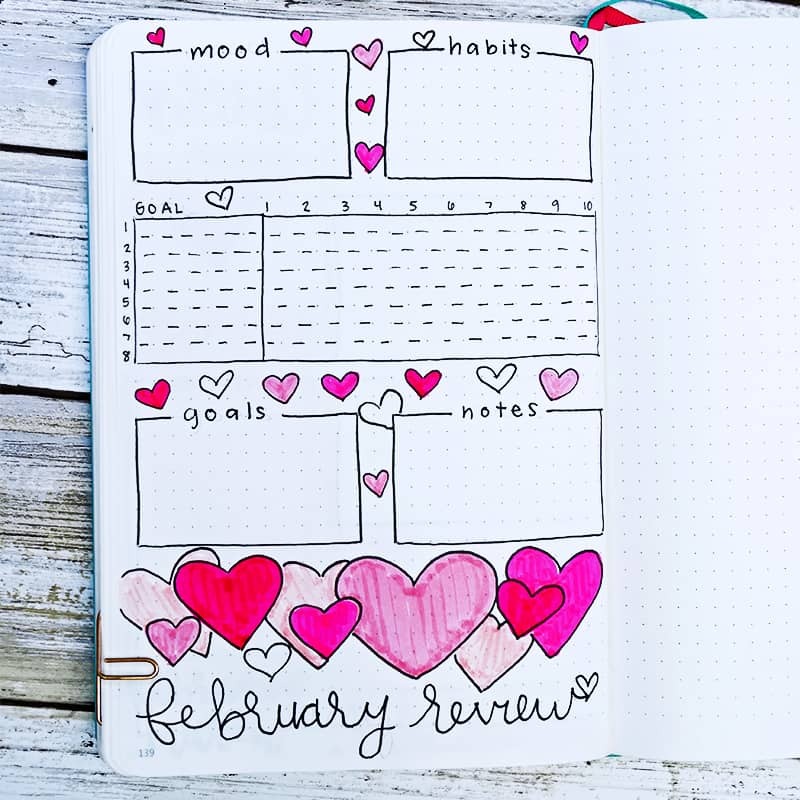 I rate the heart theme a perfect 10/10 and I 100% recommend trying this theme in your next bullet journal. 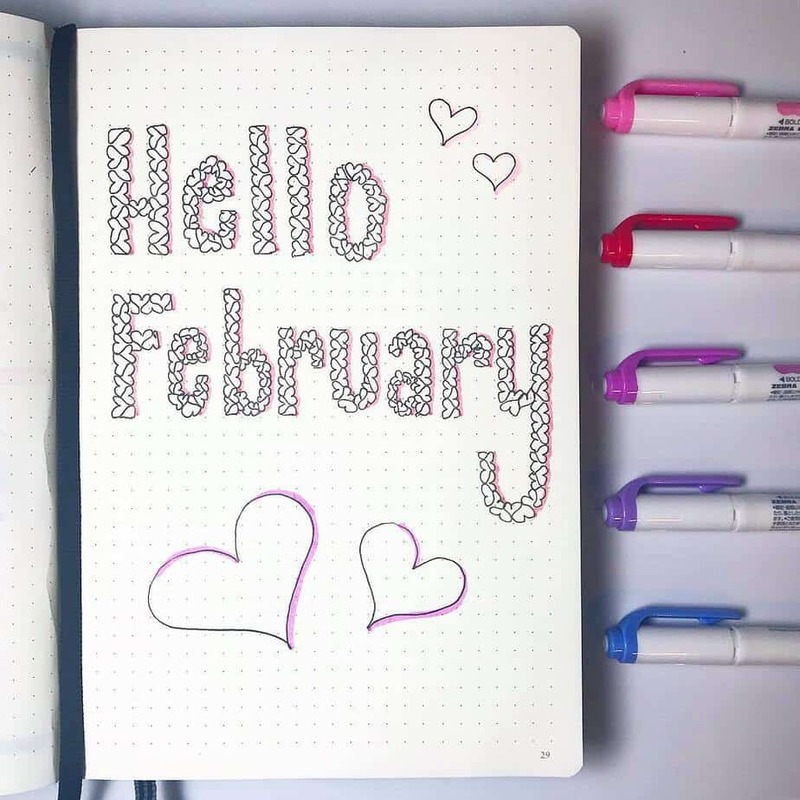 Plus, you don’t have to wait for next February to get started! 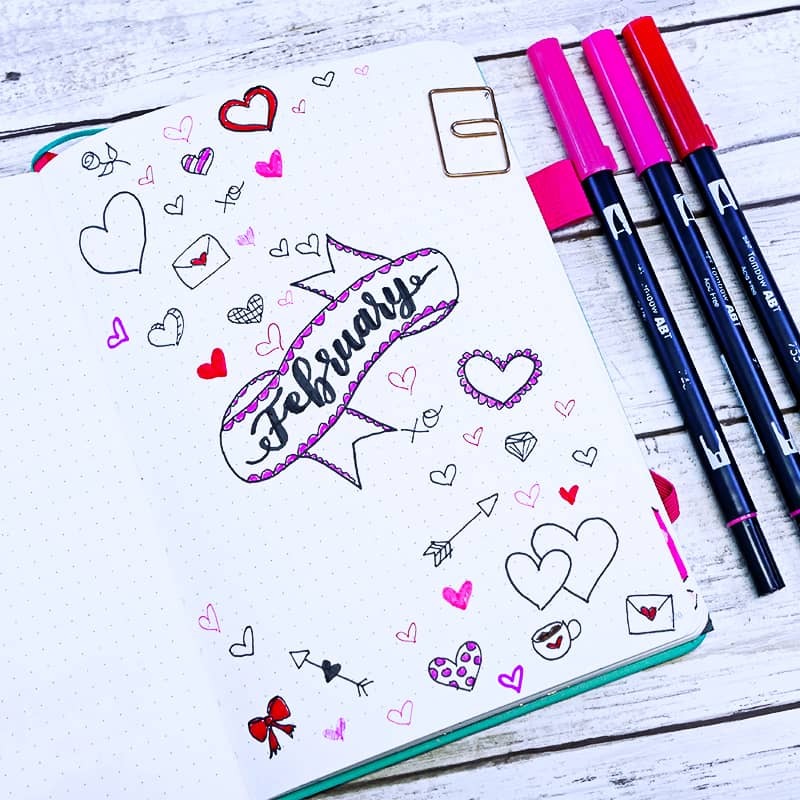 Hearts are perfect for any time of year. In fact, did you know that other countries and religions celebrate Valentine’s day on a completely different day? 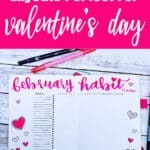 Want to check out last month’s theme? Check out beautiful unicorn-themed layouts right here! 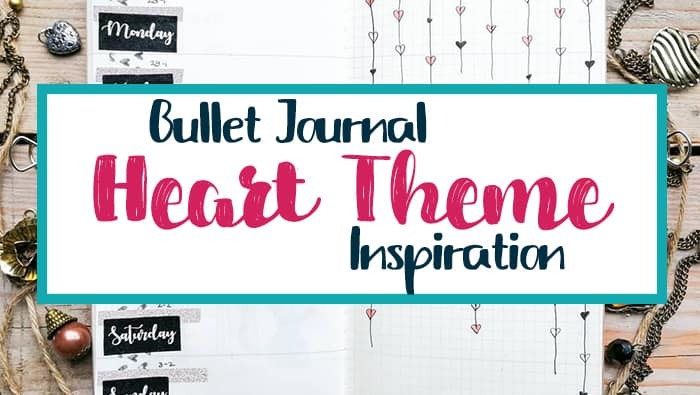 Have you ever used a heart theme for your bullet journal spreads? What did you think of it! I’d love to hear your review in the comments! Hey Rachel! Thanks so much for featuring my spread! Such a great theme and loved your article! Thank you so much! 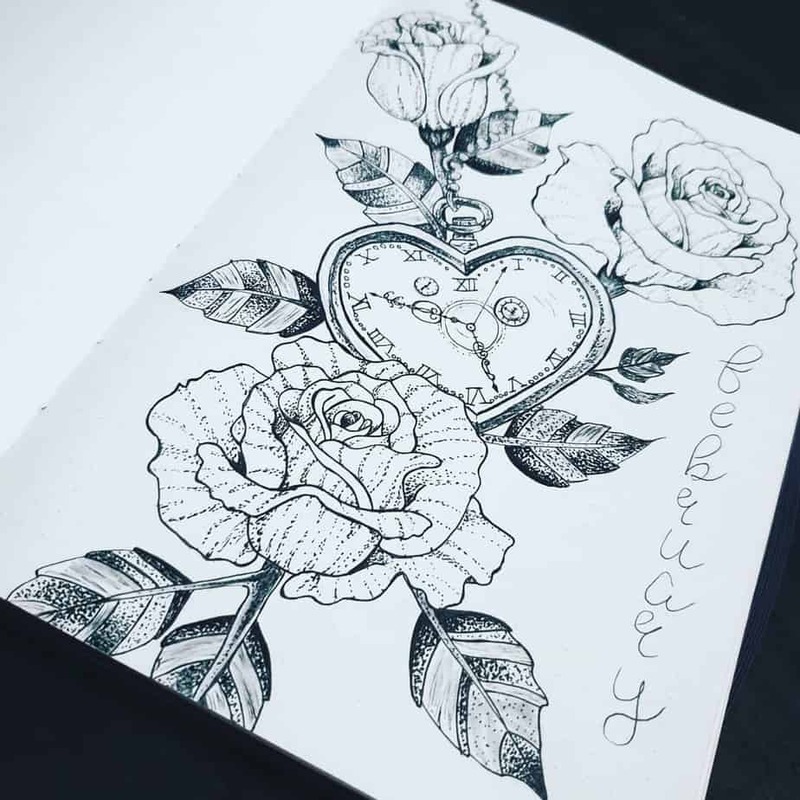 Your work is beautiful and I appreciate you sharing it with me on Instagram! Love your ideas! Thank you for sharing and inspiring. Thank you so much for reading, Christine! I appreciate it!